There is something to be said about getting what you think you should. A pepperoni pizza should have, well, pepperoni, cheeseburger cheese, and full bag of chips should be just that not “some settling of the contents may occur during shipping”. We can put men on the Moon yet a bag of chips is only about half of what the bag will actually hold. 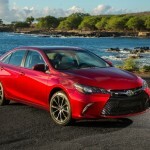 We bring this up because recently we were given the new 2015 Toyota Camry for a week. 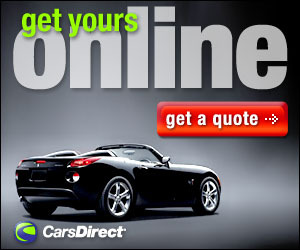 Having driven many cars in the last few years, we had yet to get a chance to drive the number one selling car in America. 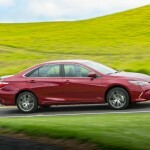 There’s a good reason why the Camry can be seen in more than one driveway on a suburban street, filling up many of the parking spots at the mall and at nearly every stoplight. 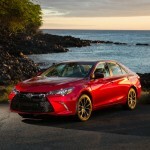 Toyota has always offered the Camry as a decently priced, well-built sedan with a lot of features and a good drive. However, the styling seemed to be becoming dated. 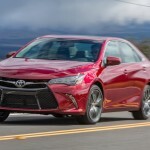 Sure last year the Camry was still number one , but there were some grumblings about the dated, boxy style so Toyota decided a refresh was in order. The refresh for 2015 went bumper to bumper and nearly everything on the exterior was changed, all that remains from last year is the roof. 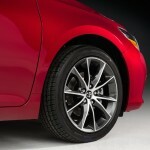 The exterior according to Toyota is a bit more aerodynamic and the suspension is stiffer. 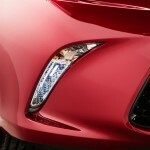 The interior is quieter and Toyota used more premium materials to achieve a more high-tech upscale look. New for 2015 is a 4.2-inch TFT screen situated between the three-dimensional Optitron gauges. There is also a new center stack. Depending on model trim, the Camry offers a variety of audio and Navigation packages with either 6.1-inch or 7-inch displays. The display serves as a portal for an upgraded Entune, Toyota’s multimedia system with access to the subscription-free App Suite. 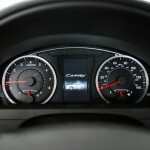 All models have standard Bluetooth wireless connection and steering wheels in all models feature integrated audio and Bluetooth controls. There’s also a new enclosed bin in front of the shifter offers a 12v power port, USB port and an available wireless charging system for select smart phones. Powertrains carry over. There’s a standard 178-hp 2.5-liter four and an optional 3.5-liter V-6 with 268 horsepower. Both are mated to six-speed automatics. There are four different trim levels to choose from, L, SE, XLE, and XSE along with a hybrid. The L and XLE have more conventional features, the SE and XSE are sportier. The model we had for the week was the XSE with the 3.5-liter V-6 and truth be told our first impression was a very good one. unique shock absorbers with internal rebound springs, firmer bushings and unique electric power steering tuning. The SE and XSE transmission features faster shift times when in “S” mode, along with downshift blipping control. All in all the XSE model looks very sporty indeed. The truth is that the 3.5 liter V-6 simply doesn’t give a “sporty” amount of power. Sure there is plenty for a daily commute, and the fuel mileage is admirable (21 city, 31 highway) but it’s almost like ordering a pepperoni pizza and getting only the crust. 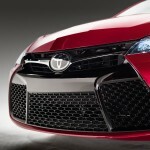 If Toyota was aiming for a sedan that looks sporty yet won’t put you back in your seat then they have hit a bulls eye. Gives a turbocharger, a beefier engine, a pure sport mode that will at least allow for an engine growl, something. For now, the “sport” model may look sporty but comes up short of actually driving that way. By no means does this take away from what Toyota does have. 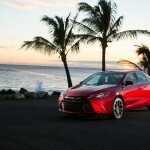 There is a reason the Camry has been the bestselling car in America for the last 12 years. 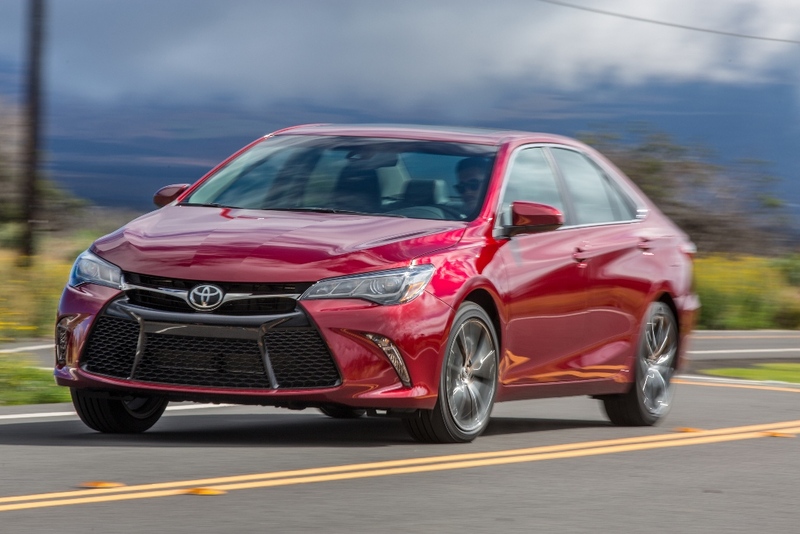 The Camry is a quality car that offers a lot of features for not a whole bunch of money, that will hold its value for years. Our XSE topped out at $37,768 meaning that a good negotiator might be able to get one for around $30,000 making this car a great value. 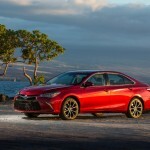 While the “sporty” moniker might come a bit short on the road the newly redesigned Toyota Camry is still the market leader and there is no doubt it will be for years to come. Engine (as tested): 3.5 Liter V-6, 268 horsepower at 6,200 rpm and 248 lb.-ft. of peak torque at 4,700 rpm.